If you have any questions about the ROBERTO CAVALLI information page below please contact us. This generous luxury yacht ROBERTO CAVALLI (RC) is a motor yacht. 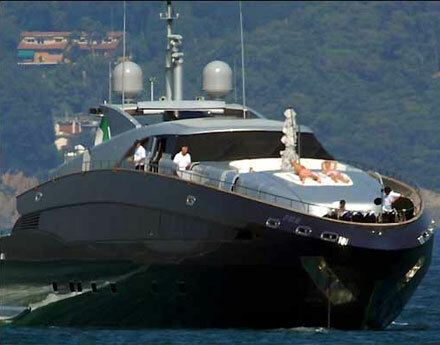 This 41 m (134 ft) luxury yacht was developed at Baglietto in 2004. ROBERTO CAVALLI (RC) was formerly called 10185. Superyacht ROBERTO CAVALLI (RC) is a majestic yacht that can accommodate up to 8 people on board and has a total of 4 qualified crew. Launched for 2004 the comparatively recent interior design showcases the endowment in the designing of Studio Gagliardi. The yacht's general design work came from Tommaso Spadolini. The professional naval architect firm plans are the work of Tommaso Spadolini. Motor Yacht ROBERTO CAVALLI (RC) received her elegant interior designing from the interior design office of Studio Gagliardi. In 2004 she was actually launched with triumph in La Spezia and post sea trials and detailing was thereafter delivered to the owner. 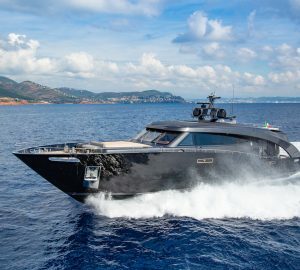 Cnb Yachts (Cantieri Navali Baglietto) completed their new build motor yacht in Italy. The hull was built out of aluminium. The motor yacht superstructure component is fabricated mostly with aluminium. With a beam of 8.6 m or 28.2 ft ROBERTO CAVALLI (RC) has spacious interior. The motor yacht is powered with twin ample MTU main engine(s) and can touch a bracing top continuous speed at 35 knots. The main engine of the yacht generates 3700 horse power (or 2815 kilowatts). Her total HP is 7400 HP and her total Kilowatts are 5630. Coupled to the ROBERTO CAVALLI (RC) engines are twin water jets. Her fast cruising speed is 29 knots which offers a range of 1000. The generous luxury yacht M/Y ROBERTO CAVALLI (RC) is able to accommodate up to 8 guests in addition to 4 qualified crew. 40.8 metres / 134 feet. The propulsion comes from two 3700 Horse Power / 2815 Kilowatts MTU. The Model type is 16V 4000 M90 diesel. Approximate Cruise Speed is 29 knots. Her top Speed is around 35 nautical miles per hour. Range in nautical Miles is 1000 at a speed of 29 knots. The luxury yacht ROBERTO CAVALLI displayed on this page is merely informational and she is not necessarily available for yacht charter or for sale, nor is she represented or marketed in anyway by CharterWorld. This web page and the superyacht information contained herein is not contractual. All yacht specifications and informations are displayed in good faith but CharterWorld does not warrant or assume any legal liability or responsibility for the current accuracy, completeness, validity, or usefulness of any superyacht information and/or images displayed. All boat information is subject to change without prior notice and may not be current.